<< Tango Mike Mike — A Must-See Video! 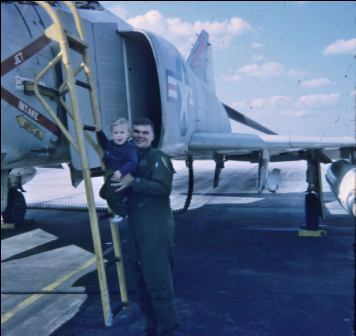 1968: Jerry is having fun with our son, Craig, at NAS Beaufort in SC, where he trained in the F4, before deploying to Southeast Asia. During one of his hops, the nose cone fell off and landed in the ocean off the coast of South Carolina. Jerry flew the aircraft back to the base and landed without incident, but it was a memorable event. Senator Jim Webb, [D-VA], recently went on record, saying that he wanted the US Government to freeze $1 million in annual funding to the Vietnamese government for assistance with their search, recovery, identification and repatriation of Vietnamese MIAs. Vietnamese officials reportedly have said that they will focus only on North Vietnamese and Vietcong MIAs, not South Vietnamese MIAs who fought on the other side during the war. Senator Webb has a long history of involvement with Asian affairs, including a much decorated military career as a Marine Corps officer who served in the Vietnam War. In recent years, he married a South Vietnamese woman, who was able to leave Vietnam after the fall of Saigon in the mid 1970s. Understandably, Senator Webb has a deep-seated personal and professional interest in seeing that U.S. funds given to the Vietnamese government for their MIA efforts are divided fairly, regardless of allegiances during the Vietnam War. “This project must ensure fair treatment to MIAs from the North Vietnamese Army, the Viet Cong, and the Army of the Republic of Vietnam,” Webb said in a prepared statement. 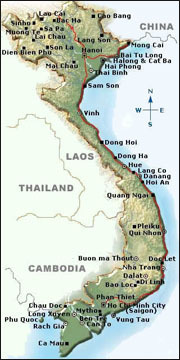 “However, according to information provided to my office, discussions between USAID and the Vietnamese government indicate that former ARVN soldiers are not counted by the Vietnamese government as among the missing, and therefore are not included in this project,” said Webb in a recent Washington Post article. As a family member of an MIA still unaccounted for in Vietnam, I sympathize with Vietnamese in America, who are spearheading efforts to find missing loved ones and friends in Vietnam. Many say they want to ensure that their MIAs receive a proper burial according to Vietnamese culture. While the buzz word is “closure” when describing why American families want to bring home their missing family members, left behind after the Vietnam War ended, the truth is that our country is so diverse in its ethnic, religious and cultural makeup that there is no single word to describe how different families feel. For most of us, it has been pure agony knowing that our loved ones were left behind in a country, thousands of miles away, where they never wanted to be and ended up never leaving. As many know, my first husband, Capt Jerry Zimmer, a Marine Corps jet pilot, was shot down on Aug 29, 1969, and our family is hopeful that we will be able to bring home Jerry’s remains to the USA in the future. Because of time, destructive acidic soil, and lack of witnesses – to name a few impediments, finding our loved ones has become an enormous challenge for the U.S. Government, whose skill in this area is beyond reproach. Although not a perfect solution, the Vietnamese living in America can feel some comfort in knowing that their loved ones likely are buried somewhere in South Vietnam. It is my understanding that the Vietnamese people in wartime Vietnam buried the corpses of downed soldiers, regardless of their military affiliation, for health reasons and cultural beliefs. Although there are a number of interpretations as to why burial traditions are important to the Vietnamese, most agree that burial brings peace to a soul that otherwise will suffer from endless wandering and wailing — possibly even bringing bad luck to a village in which the soul wanders. I hope that Vietnamese with missing family members who served with the ARVN, know that they died fighting for the country they loved, and thankfully are at least buried in their homeland. For decades American families with loved ones unaccounted for in Vietnam have prayed for the day to come when their loved ones’ remains are repatriated to the country they fought for and loved, so that they can be at peace in their homeland, too. The bottom line is that we both – Americans and South Vietnamese — wish for more, but we may have to settle for less. This entry was posted on Thursday, October 13th, 2011 at 2:12 pm	and is filed under MIA Recoveries in Vietnam, Vietnam MIA. You can follow any responses to this entry through the RSS 2.0 feed. You can leave a response, or trackback from your own site.